Despite a few reasonable examples (FDR, for one), the question everyone must stop and answer is this: when was big government ever cool? 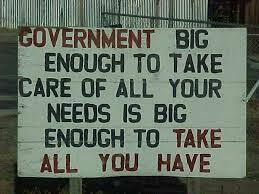 The unavoidable truth of the matter is that big government might not be the answer we need in this day and age. 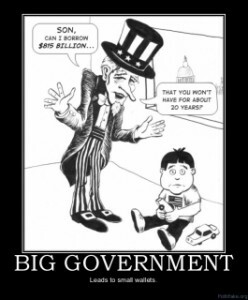 It is easy to admit that at certain times – during a serious depression, during an international crisis, or during a weakening middle class – big government serves a purpose and seems to do good for society. However, in a society where a recession is showing signs of recovery, the housing market is growing again, and the middle class is expanding, it is the opinion of this reporter that increasing the size and scope of the government may be a bad choice. And I’m being nice. What we can’t escape from is that three-fourths of the time big government is not the answer. What should be made clear is that big government can be the enemy of liberty, prosperity, and harmony, because it attempts to impose restrictions, regulations, and (dare i say it!) taxes on people who, nine times out of ten, do not want to be disturbed and can’t afford them. 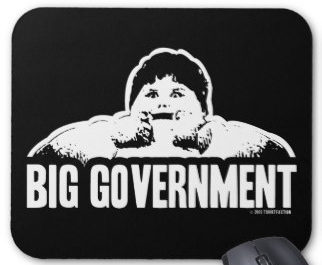 For the sake of clarity, this blog has simplified the popular conservative reasoning on big government down to a handful of major points. Here, listed below, are four reasons big government is bad, ineffective, and unnecessary, especially in the present day political situation. So, time to get started. 1.) Excessive government intervention limits private growth because it directly interferes with the private sector of the United States’ economy. When restrictions are placed on big business owners, small business owners, and even 12-year-old Joe Blow’s Lemonade Stand, it has a negative impact on many aspects our economy, particularly corporate creativity – AKA, progress.What this means is that when the government interferes with businesses, it limits what is possible for a corporation to do. If this happens, competition between businesses slows down and new products are not made because businesses have no incentive to come up with “the next big thing.” For instance, if the government were to ad extra taxes to Apple Computers iPhone sold, then Apple would have no incentive to create a bigger screen to beat out the Samsung Galaxy S phone. To sum it up briefly, government intervention limits progress due to the fact that it takes away the incentive (money) to create something better than what is already out there. Competition is the source of progress, and when it is limited, progress is slowed. 2.) Excessive government intervention requires destructive taxation because when a government is more apparent in people’s live, it needs to take more of their money. When average citizens are taxed off their feet, the incentive to work goes down because a person’s right to make a decent buck is suddenly hindered. What happens next? The economy slows. When people live in a society where money is scarce and no one wants to buy anything, consumerism suffers – which means stores don’t make money, businesses can’t flourish, and the whole structure of capitalism goes in the crapper. If a government is small, it is very easy to have a good tax system. In other words, if a government is big, with a bloated public sector, it is very easy to have an onerous tax system. 3.) Excessive government intervention causes deficits and debt because an invasive, overbearing, and omnipresent state spends more money. Democrats (ahem, socialists if you’re thinking of Obama) routinely spend more money than they collect from tax payers. The result is disastrous: a country digs a hole, gets stuck in quicksand, or suffocates from a lack of oxygen (money). In a time like today’s, spending money is like trying to get out of that hole by digging deeper. Or like trying to escape that quicksand by swimming through it. Or, like trying to get that oxygen by holding one’s breath. What cannot be contested here is that spending money while you have none is a bad idea. The nation’s situation will prosper if our government lets the people live their lives without it’s intervention, because they will work harder, spend more, and in effect directly benefit the economy. 4.) Excessive government intervention violates the constitution because the founding fathers wanted a country free from tyranny – tyranny abroad, and, tyranny at home. The point being made here is that when the government gets too big, it becomes despotic and authoritative – the opposite of what the founding fathers wanted. The current size and scope of the U.S. government is inconsistent with the system created by the founding fathers, and their intentions should be taken more seriously. In conclusion, what America needs today is a businessman – someone who knows how to balance a checkbook and balance a budget. Even though the president is technically not responsible for the economy, a politician like Romney might be a better option because the United States is not in need of another FDR. Even FDR cancelled some of his own reform policies at the end of the New Deal because he “feared he was creating a society dependent upon working for the government.” The country, in fact, is in need of leader who knows how to run a business; a leader who knows when to spend money, when not to, and when to let the people live with minimal government interference. In essence, we need a leader who’s reminiscent of our forefathers, one who’s dedicated to the celebration of the individual first (one of our country’s founding principles) – not the group.